This is my baby cardigan in a wine color. This color inspired the addition of an apple hat. This color is absolutely gorgeous on ANY baby! This is one of my favorite sweaters to knit. It's thick and squooshy. 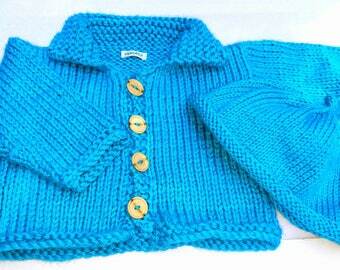 The yarn is very soft acrylic to make it an easy-to-care-for sweater. The customer chose this deep red/wine color which looks great on both boys and girls. I received compliments galore when people saw this sweater. The buttons round with a woody-type of look. They slip through the button band wherever you want to button the sweater. There aren't any defined buttonholes. The sweater comes with a matching apple hat complete with a stem and leaves. It is a roll-brimmed hat and will fit the baby for a long tmie. 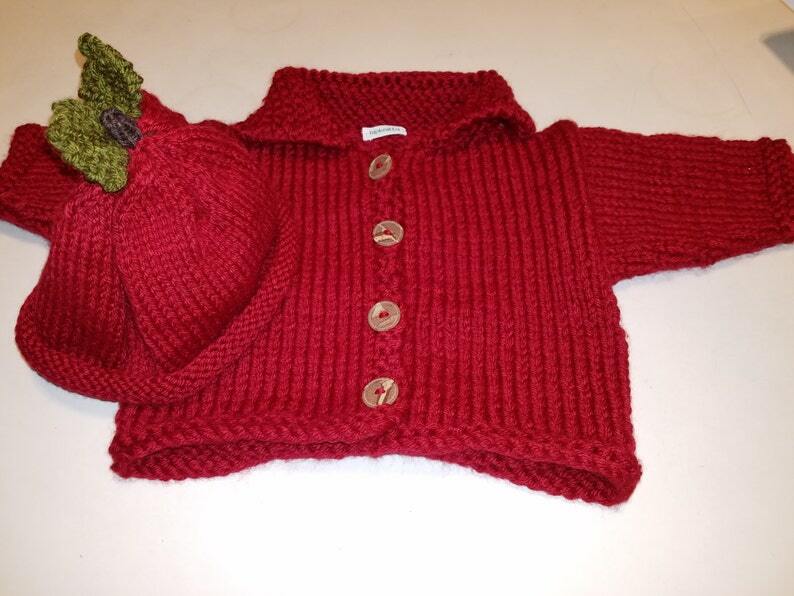 The baby you buy this sweater/hat set for will look adorable. The set can fit a baby up to 12 months old or more depending on the size of your baby.